DCmud - The Urban Real Estate Digest of Washington DC: Arlington's "Not So Big House"
Descended from a designing family, Principal Krista Minotti Schauer of KMS Architecture believes the profession is in her genes. At age 18, her grandfather labored on NYC's Chrysler building and then became a builder; her father studied architecture and building sciences at Clemson University; and her mother is an artist whose finely detailed work informs Schauer's. 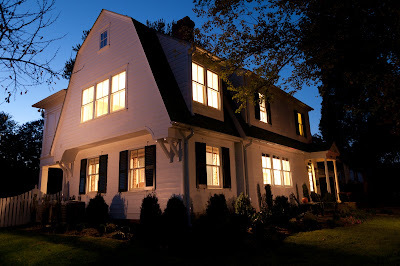 In an effort to modernize and make more functional a 1923 3-bedroom, 2-bath farmhouse in Arlington, Virginia, without adding a lot of space, Schauer said she was inspired by architect and "The Not So Big House" author Sarah Susanka, having heard her speak at an AIA Convention. Though some additional square footage was required, Schauer, like Susanka, elected to scale back the amount of new space favoring quality and function over quantity. DCMud spoke with Schauer about the project. DCMud:Tell us about the home and program. Schauer: The original home was minimal in terms of any detail, but it had the character they liked -- 8'6" ceilings -- that old farmhouse motif. This needed to remain, but it needed to live in the 21st Century and accommodate a family of four. 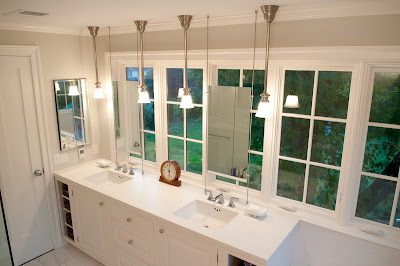 There was an addition on the back off the kitchen -- a full bathroom -- something useless and quirky. 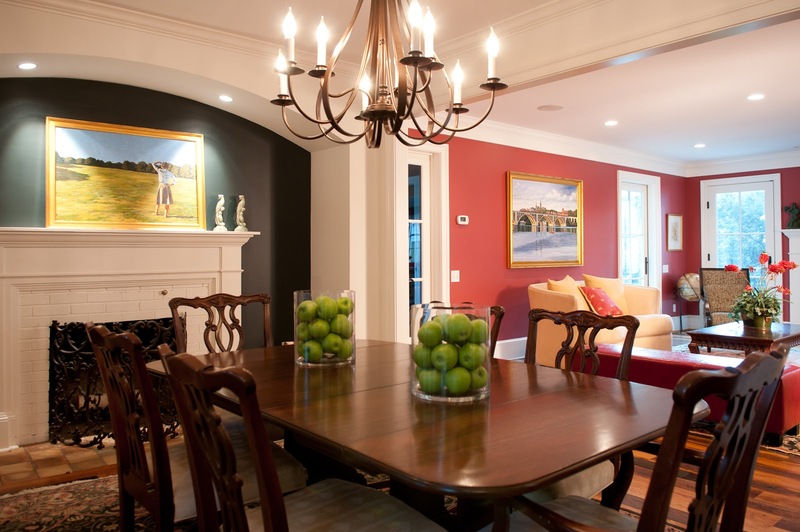 The project started as the homeowner's idea for a family room on the back, not planning to redo the kitchen, and for a second floor master suite leaving the existing bedrooms intact. But once we got through the design portion, they understood that the flow/circulation of the house needed to change, which would involve the kitchen. DCMud: But even with that information, much more changed for the homeowners at that point, correct? Schauer: It certainly did. In 2009, during a time of inflated appraisals, though we already had a contractor on board and permit in hand, the client's financing suddenly fell through for the construction loan as the house didn't appraise the same way. The construction industry was also not on board with green building, which was a goal here. While we'd originally designed for the existing 3 bedrooms and 2 baths upstairs, we had to creatively change it to a 5-bedroom, 2.5-bath. 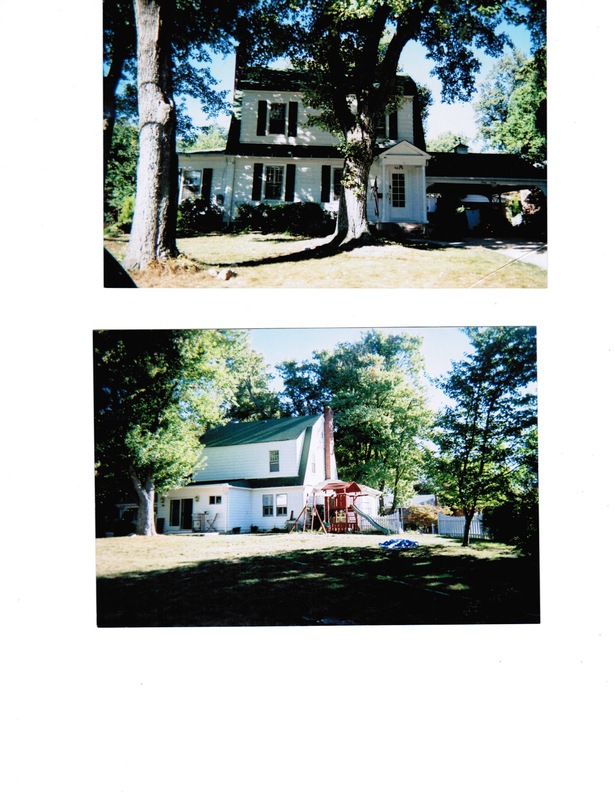 This was done by reworking a smaller enclosed porch on the side of the house, which had ultimately appraised for no value and which a previous owner had turned into a den. In the original design, we were going to take that living space and turn it into a long covered porch along the side of the house. We'd have had an extension on the back, and then the long covered porch. DCMud: So how did this change? Schauer: As the appraisal considered square footage over most anything else, along with number of bedrooms and number of bathrooms, we abandoned the porch idea and maintained the first floor's square footage by creating a TV/office space and half bath, so it could actually read as a spare bedroom. We then added more second floor to the existing second floor, on top of that space, creating another bedroom there. The result was two existing front bedrooms, the new one, and then the master -- a total of four upstairs.While it did add square footage to the second floor, it did not add to the property's footprint which made it cost and environmentally effective. DCMud: Speaking of the environment, what sustainable elements are found in this redesign, along with choices of color, etc. 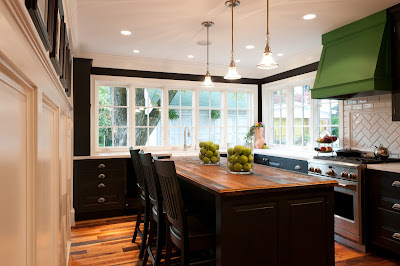 Schauer: Fairly early on, the owners wanted wide reclaimed oak flooring with color variation and a rough-hewn texture. We knew it would be a feature and focal point of the home. And going back to the Shaker-like minimalism of a farmhouse, I'd initially envisioned a neutral palette, interior and exterior. We replaced the exterior with Hardiplank because the original was in such bad shape. And it's got so many massing elements on the back, painting it white brought a cohesiveness to the home. Accordingly, I thought the interior would be the same -- light-filled and a light palette so as not to compete with the wood floors. But the owners wanted black cabinets in the kitchen, which did provide a nice contrast. DCMud: The walls appear to be bold jewel tones, not the quiet colors you mentioned. Schauer: When it came time to paint, the owner's vision was different than mine. She wanted lots of color, and she was right. 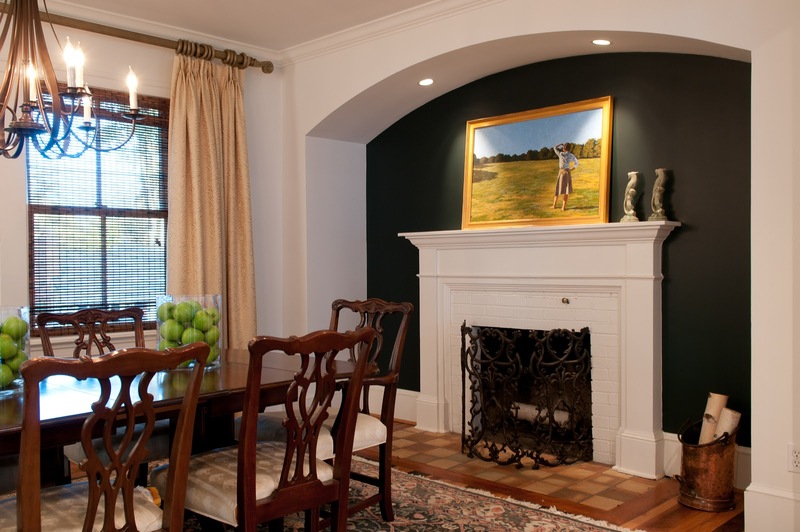 We did one accent wall in a really dark green - almost black. That same color is in the TV room, but there's a glass door from the living room into the TV room, so that black becomes a background and visually balances the TV room with the black cabinets in the kitchen. With small spaces and small houses, having a visual window, so to speak, from one space to the next makes it feel much larger and more open. 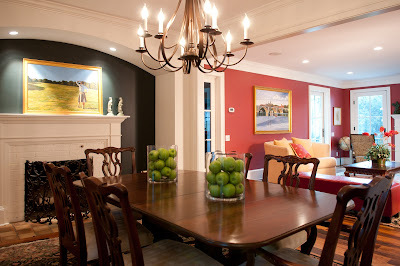 In this house, the dining room is a defined space off of the living room, but it's got a wide cased opening between the two so you still get that visual connection from one to the other. When you're in one space, your eye is borrowing space from the adjacent space. DCMud: What did you take away from this project, which was apparently full of economic and architectural twists and turns. Schauer: A piece of architecture works as a whole: the interior and exterior have to relate to one other. And, the most successful projects are a collaboration like this one when contractor, owner and architect work together under evolving circumstances. Marvellous interview. 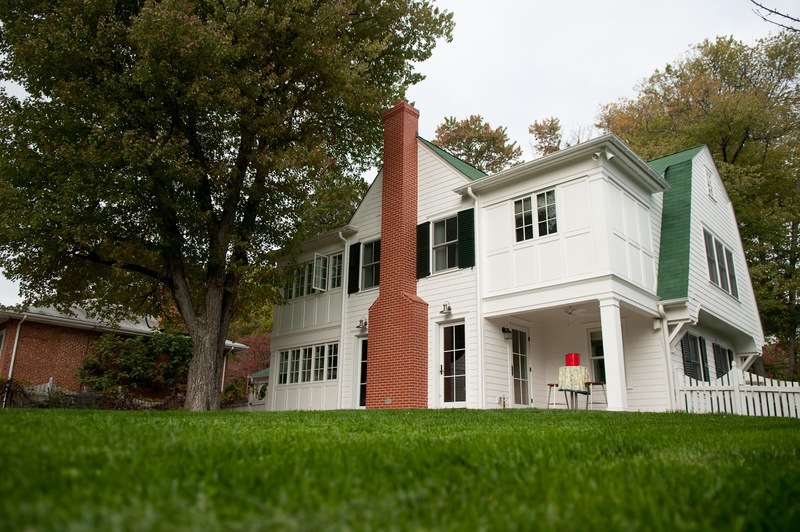 Projects like this are hard -- for the owners, for the architect, for the contractor -- and Ms. Schauer shows how to keep things moving despite myriad obstacles. How to balance practical requirements with aspirations. It's also a reminder that sometimes, in the end, the guiding hand of the architect is perhaps not readily apparently, but nevertheless it was absolutely necessary.